Like pretty much every event at EPT Barcelona this past week, the €10k High Roller was a record-breaker. 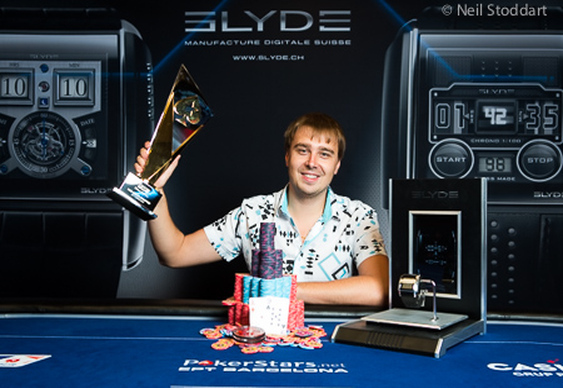 393 entrants created a massive prize pool of €3,851,400 with Ihar Soika eventually taking home the biggest chunk of it. The Belarusian outlasted a stacked final table field that included British star Stephen Chidwick, Marc-Andre Ladouceur, Benjamin Pollak and Aussie Millions winner Ami Barer. After Ismail Erkenov was eliminated in third, the not inconsiderable figure of Jason Mercier was the only thing standing between Soika and a surprise win. It didn't take long for the chips to hit the middle with Mercier the man in danger with pocket sixes against Soika's As9d. An Ac10h3d tilted the odds firmly in the east European's favour and the title was his after two further bricks on the turn and river. Soika pocketed €747,200 for his efforts in Barcelona. To put that score into perspective, his combined live tournament earnings before his trip to the Catalan capital stood at $160,872. It was of course a fine effort from Mercier too, who was in last place with just seven Bbs left when play was seven handed. Image courtesy of Neil Stoddart at PokerStars.